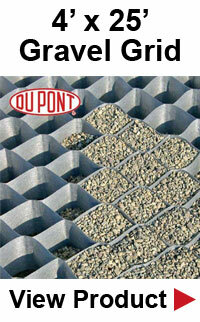 Grass and gravel reinforcement is used for parking lots and driving lanes such as fire access, utility and emergency access lanes. You need to use a reinforcement that will withstand time and is extremely durable. Ideal Sustainable Solution for Grass and Gravel Surface Application, TYPAVE™ 25 by Typar is the newest US manufactured, porous paver made from recycled plastic material that also meets LEED highest rating. Leadership in Energy and Environmental Design is a certification program that concentrates on new commercial building projects and uses a rating system. This plastic paver is designed to handle a reinforced surfaces for H25 loading specifications while protecting the grass surface. TYPAVE™ 25 paver's structure is composed with Quick-Snap essential joints between sections, providing a strong structure that can be staked into the ground, preventing any chance of breaking or slipping. The apparatus for shipping is constructed into the paver, forming a perfect fit on a 48 x 48 pallet with double stacking capability for a greater cost efficient shipping alternative while reducing carbon foot prints. Once it has been completely installed, the paver structure will perform reinforcement for emergency, utility and fire access lanes, other drive lanes and parking lots. In turn, it will not damage grass, keeping its esthetics in perfect shape. TYPAVE™ 25 paver's open structure offers a penetratable reinforcement surface that is good for traffic while allowing water to penetrate into the soil below. When you have a huge building project, look to the best for your reinforcement needs. The Ideal Sustainable Solution for Grass and Gravel Surface Application, TYPAVE™ 25 by Typar is durable, long lasting solution made in the USA. Ordering more than 1,000 Pavers?